After 25 years and over 150 rescues, Wells' Mersey-class lifeboat Doris M Mann of Ampthill is nearing the end of her RNLI service life. 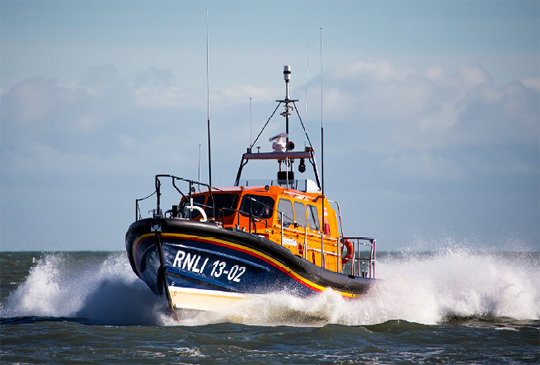 The RNLI will be replacing her with a new state-of-the-art Shannon class lifeboat to provide a faster, safer and more effective life-saving service off the Norfolk coast for many years to come. With our recent local appeal, we have raised £250,000 towards the cost of the new lifeboat with generous donations and fund-raising by the local community and from supporters across the UK and further afield. The remainder of the boat's cost has been met by generous donations and legacies with a further £1.1 million pledged by the Lifeboat Fund, the civil service charity which has been fundraising for the RNLI for 150 years. A new boathouse will be built to house the Shannon and her launching carriage (which are too big for the existing building) along with Wells' inshore lifeboat, crew and workshop facilities. Any further funds or donations received in relation to this appeal will now be put towards the cost of the new building. The RNLI is also broadening its own fundraising efforts to appeal to businesses in the wider region to provide support for the project's costs. We've done it! Or rather... you have! In 17 months, £250,000 has been generously raised to help fund a new Shannon-class lifeboat for Wells and the North Norfok coast. We are grateful to everyone who has donated, fund-raised, helped and supported us both locally and from right across the UK and even further afield. Your contribution is appreciated and will help to save lives and keep our volunteeer crews safe in the years to come. Look out for more news of the Shannon on our news pages. The Royal National Lifeboat Institution (RNLI) is a charity, registered in England and Wales (209603) and Scotland (SC037736). This website is managed and maintained by local volunteers at Wells-next-the-Sea Lifeboat Station and is not the main RNLI site. All text and images copyright (C)2005-2019 RNLI Wells Lifeboat Station, or as indicated, and may not be downloaded, copied or reproduced elsewhere without prior permission of the station or the relevant copyright holder.